Much better. I wish I’d done mine this way. Back on your question. You could slope your cap down from the centerline out but you can’t get too crazed about it. I did some three-dimensional trig on the problem. You have established a ten degree slope on the centerline. This is good. The air flow should stick like Super-Glue. By my calculation, you could slope down away from the centerline at an eight degree angle (about a 1-in-8 slope) and maintain less than a twelve degree (1-in-5 slope) angle relative to the top of your cab, so the air flow should stay attached to the end. If your truck is 80 inches wide that would allow you to lower the height at the rail by 5 inches from the centerline. Nice thing is it will shed rain like a duck. If you read the thread about “commercially produced aero cap” you’ll see the evolution of Bondo’s cap. I can’t seem to find the video of it in the wind tunnel but I seem to recall seeing the smoke sticking to the cap all the way to the lip. That would make it the gold standard. Now Bondo held the height at the rails to the same as the centerline, but he is trying to maximize internal (payload) volume rather than seek the maximum wake area reduction. Somebody (I believe it was Frank) posted some tips on heat-bending coroplast. This might be useful bending that Texas-sized political sign into a righteous cap. BZP, you have a lot of sticks in the fire: ducktail + half tonneau, curved aero lid, not to mention other body mods. 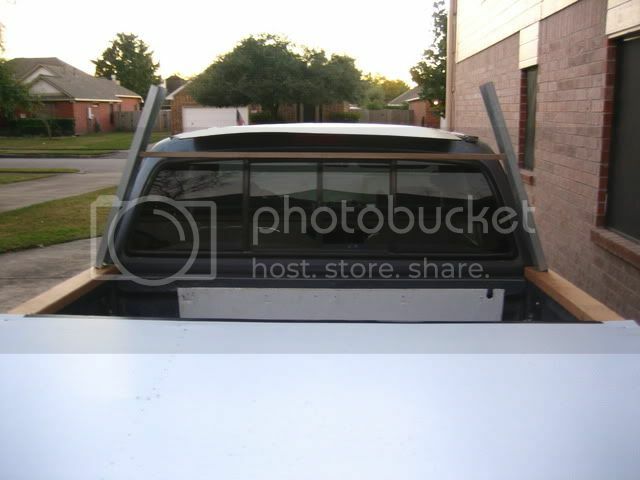 In the pic above was the tailgate up or down? The way it's buckled down in back between center and side supports makes me wonder whether that was due to (a) vacuum effect underneath or (b) positive pressure above. If (b) that would suggest attached flow. Tufts would be helpful. A passenger with a video camera could be very valuable. Our trucks are very similar. I have an 02 Tundra xCab. I believe our cab and bed body dimensions are the same. This is one aerocap design I have in mind. I would have to guess b since I could see where the air was pushing it down as I was speeding up. Yer aerocap design looks good. 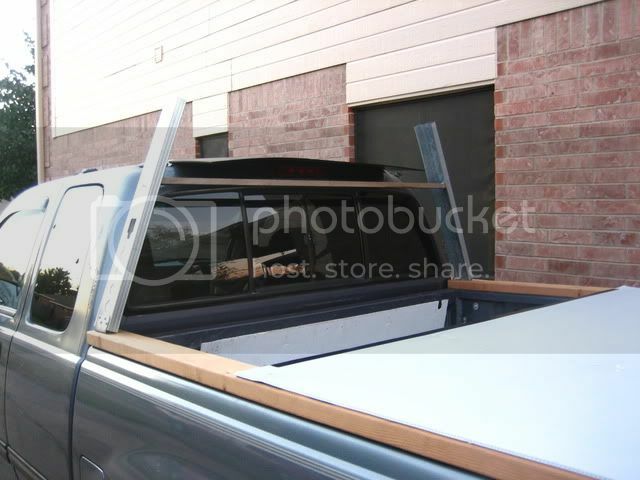 I guess yer approach is similar to a tonneau that caps over the sides...except the sides are extended up from the bed rails. I guess that would be one way to approach current tonneau owners. 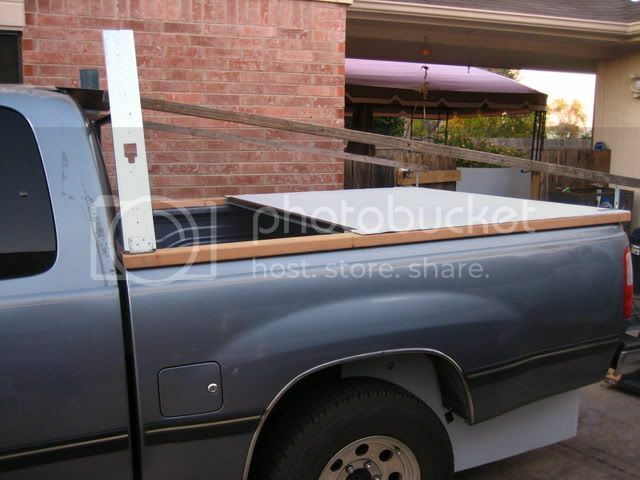 Make a kit that made use of their tonneau to make it more aerodynamic. 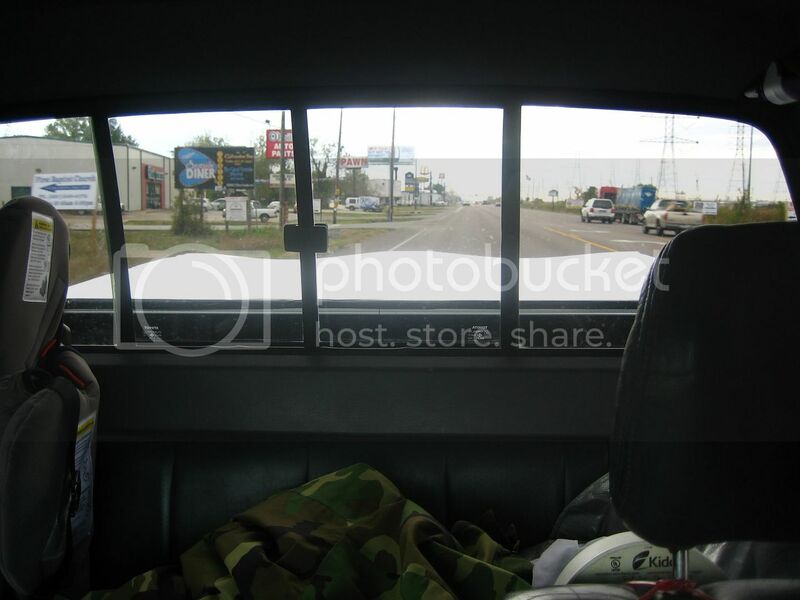 As I think about it...it wouldn't work because the width of the cab is smaller than the width of the bed. 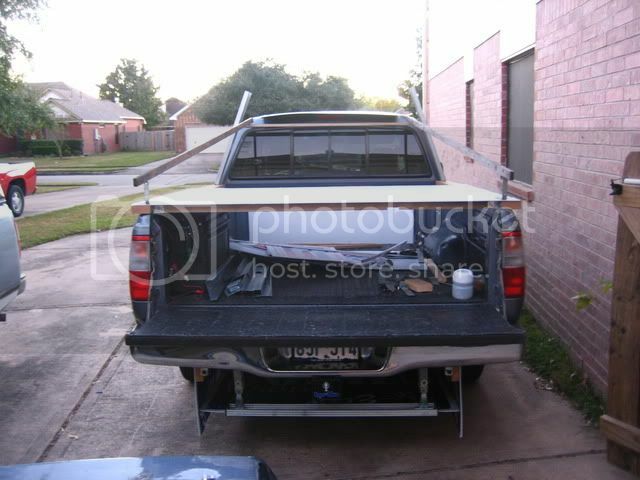 My Tundra came with nice fiberglass tonneau courtesy of the original owner. It helped my high score of 22 highway despite the EPA sticker. Being a 4.7L 4WD model I suspect further improvement is high fruit. Still, it's fun to think and rethink possibilities. I sold that cover because it's not 5th wheel friendly. Removal, storage and reinstallation were solved problems but a lot of hassle. I have a short cap that I may yet annex for off-towing season. Given other priorities and current situation right now, however, to just get through this Winter I'll probably just put my toolbox back on the front of the bed and close off the rest of the box to keep snow out. The short cap does create a blind spot that bothers my wife when she needs to drive it so in the grand scheme I'll probably have something to share about that mod before long. Gitting ready to sacrifice a single sheet of coroplast and reusing the 1x2 wood from my test belly pan to make a quick frame/cover fer the hatch. I should be able to make the sides and compute the angles I need to taper the main rails to. Well...the post is just to hold it up since I'm working by myself and it just happened to be handy. I guess it could be lowered...but what is the ideal angle of the cap? I guess the angle would be some where between 10° and 15° based on the calculations I performed earlier. It's really about tangent angles at any given point along a progressively-steepening curve up to a maximum of 22-degrees.But that's also the hardest to construct. Dr.Kamm recommended no more than 10-degrees and proceeded to break his own rule. Dr. Hucho suggests no more than 15-degrees. I know from experience,that at 13-degrees over that much span,you'll get immediate separation and then re-attachment downstream with a locked-vortex in between. With straight angles it's all a compromise.And Frank is totally correct in that if you push the angle too steep you get separation with zero re-attachment and little if any benefit. My cover that you saw at Burger King has zero separation.If you can stand to build curvature into the cover you'll get the biggest bang for the buck. Got my front support frame roughed out...the posts will be cut down to the wood support bar. The short cap does create a blind spot that bothers my wife when she needs to drive it so in the grand scheme I'll probably have something to share about that mod before long. Takes about three days to get used to. The larger the mirror the better as "distortion" is lessened. No more looking over your shoulder to check blind spot! !